eSupplyStore.com is your one-stop source for the best bargains on the widest selection of shipping supplies, equipment and accessories. From all of the mailers, labels and packing materials you need every day to the hard-to-find materials you need for specific warehouse machinery. We offer extreme discounts on bulk orders, and lightning-fast shipping, because we know that if you're ordering it now, it means you really needed it yesterday. If you are in the hospitality or storage business, and you need to keep mattresses and box springs protected during storage or transport, eSupplyStore.com has you covered with an excellent collection of top quality poly mattress bags. 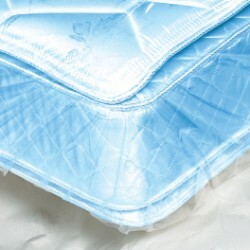 Choose from flat or gusseted mattress bag varieties below, as well as the size that fits your needs. If you need any assistance with your order, or have a question on any of the shipping supplies we carry, please call us, toll-free, at 866-437-8775.